Calling all techies! The Segal Design Institute set up camp last week at Chicago’s fifth annual techweek, where thousands of CEOs, entrepreneurs, innovators, and curious minds met to talk tech. But they didn’t just talk tech. Participants had the chance to listen to 200 of the most established tech innovators in keynote addresses, panels, debates and interviews. In addition to getting hands-on with the latest tech products, attendees had the opportunity to network at techweek’s hiring fair – which is where we came into play. At a small two-by-four table amongst IBM and #Luxward – a luxury lifestyle rewards app – sat the McCormick Engineering booth. Shrouded in an NU purple tablecloth, our table boasted brochures highlighting McCormick’s masters programs. Represented from Segal were EDI, MMM and MPD. Hundreds of eager minds perused the expo, stopping at booths that caught their interest. While companies were busy enlisting new employees, we were hard at work recruiting students and spreading the word about our prestigious programs. Amidst the sea of entrepreneurs and innovators at techweek, it’s no surprise that we ran into a large amount of McCormick alumni ranging from MEM to EDI to MSIT. Many of them stopped by to say hello and to share their excitement to see McCormick represented at the fair. Alumni did not just attend techweek, but they also had their own booths. 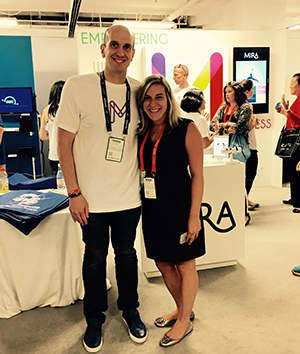 MMM alumnus Rob Dementoshowed off his company MIRA fitness, which makes fashionable fitness trackers for women. MIRA brings together technology, design and innovation – three staples of our programs here at Segal. Running into happy and successful alumni was enough in itself to make techweek a success for us. But after two days of meeting, greeting and networking, we’re confident to say that we helped grow Segal’s reputation as well. We’re looking forward to next year’s techweek and other future expos. Have an idea for an expo we should attend? Let us know!